Sometimes, it is almost impossible to not believe. It was odd that I was the one who was driving. When we are out, my husband usually drives (mainly because I enjoy just being able to look out the window). But he'd driven for a bit and was feeling quite tired - so after the next stop, I took the drivers seat. As we headed up a hill halfway through the park, I noticed something - two somethings, actually - in the road in front of us. 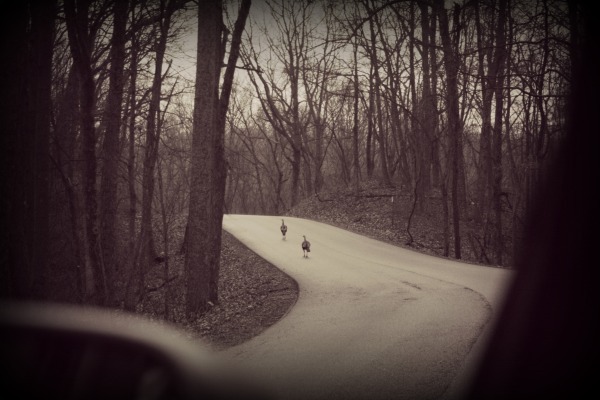 As we slowly approached, we realized the two somethings were two turkeys. They couldn't quite figure out what to do, so they danced around a bit, then started trotting quickly down the road. Allow me to flashback for a moment to explain why this was so exciting to me (beyond the fact that we were watching two turkeys trot their way down the road). Earlier that morning, I had gone to my animal medicine deck. I hadn't pulled a card in quite awhile, but felt the desire to do so in that moment (even as everyone was racing to get out of the house). I quieted myself and just asked, "What do I need to know today?" I'm willing to bet you can figure out which card I pulled: the turkey. At first I was a bit disappointed, as the turkey doesn't seem like that fascinating of an animal. But when I read the story behind it, part of which explained that pulling this card was like, "winning the lottery", I perked up a bit. Now, you may believe this was just an odd coincidence; nothing with any meaning other than there are two lucky turkeys who survived Thanksgiving. But I chose to believe otherwise. and to act on them. I took a breath, dropped into a deep gratitude for my husband, my children, the hills surrounding us - and found my way home to continue my work on expressing myself through LifeUnity. Sometimes, it might be hard to believe. Sometimes, it might seem impossible to believe in something that makes no logical sense. And yet, beyond logic, in this world of animal mysticism and synchronous magic, I found gratitude and inspiration.